Make some fancy anklets with us! Hello from Tina Newton & me! Tina is offering a 10% discount on Super Sparkle in any colorway (we are partial to ALL OF THE SPECKLES right now, but any colorway works for this promotion) if you use one of my ankle sock patterns, so you can make yourself a pair (or three!) of fabulous socks for the fall. Just purchase any of my ankle sock patterns (including Sundae Socks, any of the Socks for Busy B’s patterns (Stolen Moments, Short Attention Span, and Smithy), OR the Socks for Busy B’s collection), and you’ll find a pdf marked “SSASKAL.” This pdf contains the discount code to use at bluemoonfiberarts.com. (If you’ve already purchased either Sundae Socks OR any of the Socks for Busy B’s socks, you’ll find the same pdf in the Ravelry pattern). 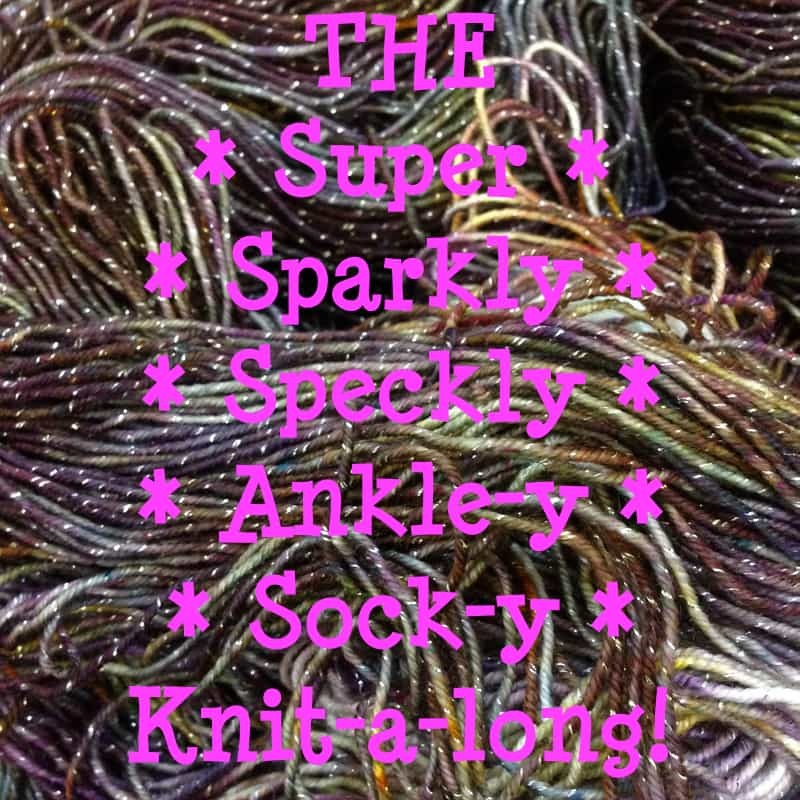 The Speckly Sparkly Ankle-y Sock-y KAL begins on Monday, August 23rd, and runs through Friday, September 30th. Anyone who has a finished Blue Moon yarn ankle sock project by the 30th is eligible for PRIZES!! (There may be extra-special prizes for sparkly socks finished by that date, as well, but you are welcome to use any of the Blue Moon sock yarns). The KAL will be run on my Ravelry page, and I’ll start a a “what color are you using” thread for pre-KAL chatter, so head on over there and say hey. To be eligible for the prize drawings, you must create a project in Ravelry, uploading at least one photo, and tag your project with SSASKAL, so we can be sure to find it. If you’re an Instagrammer, please use that hashtag over there, too, and tag both @bluemoonfiberarts and @shannonsq so we can drool over your projects!